The EM500 has a 10/100BaseT Ethernet port. 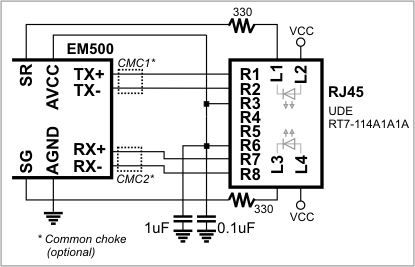 The onboard electronics of the EM500 do not include Ethernet magnetics, so magnetics circuitry must be connected externally to pins TX+, TX-, RX+, RX-, and AVCC. The AVCC pin outputs clean power for the magnetics circuitry, which is very sensitive to noise. •Do not combine the AVCC with the VCC (main power) pin. It is important to make the PCB wire connections between the pins of the EM500 and RJ45 jack (magnetics circuitry) as short as possible. Making the wires too long may cause the noise level generated by your PCB surpass the maximum radiated emission limits stipulated by FCC/CE regulations. Additionally, longer Ethernet lines on the PCB will make Ethernet operation less stable. Note that the circuit above shows an RJ45 jack with two LEDs. Further information on the use of these LEDs can be found in the LED Lines topic.